Or, as Knife Rights puts it, the Georgia Knife Law Reform Bill gets last minute reprieve. 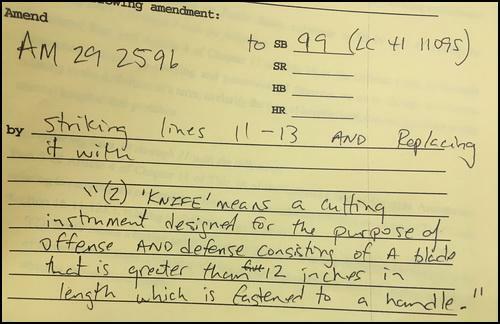 Knife Rights’ Georgia Knife Law Reform bill, SB 49, that would have increased the legal carry length of a knife blade in the state from 5 inches to 12 inches, was saved at the last minute when the language was amended onto another bill, SB 99. That bill has been passed by the Senate and will now move to the House with our knife law reform language included. We’d like to thank our sponsor Senator Bill Heath for his valiant efforts that succeeded in keeping this bill alive. Thanks to Senator Heath, and thanks to all of you who wrote or called the members of the Georgia Senate. I will have to ask Doug what caused the bill to almost die in the Rules committee next time we speak. In the mean time stay tuned, I imagine there will be an Action Alert when the time comes to put pressure on the members of the Georgia House. Knife Rights’ Director of Legislative Affairs, Todd Rathner, was in Denver this week lobbying committee members on the bill to overcome objections raised by some members, which clearly was effective. He also prepared exhibits used by the bill sponsor, Rep. Steve Lebsock, during the hearing. Rathner testified at the hearing and assisted in defeating an amendment that could have caused confusion and slowed down progress of the bill, possibly endangering its passage. We’d like to thank the American Civil Liberties Union, the ACLU of Colorado and County Sheriffs Of Colorado for supporting this important criminal justice reform bill. Knife Rights is rewriting knife law in America™. Knife Rights passed the nation’s first repeal of a switchblade (automatic) knife ban in 2010 in New Hampshire and has since passed repeal of switchblade bans and repealed other knife restrictions in Alaska, Indiana, Kansas, Maine, Missouri, Nevada, Oklahoma, Tennessee, Texas and Wisconsin. Way to go Knife Rights. Keep up the great work.